Steel that has been passed through a molten bath of zinc at a temperature of around 860°F. The steel metallurgically reacts with the molten zinc to form a tightly-bonded alloy coating that provides superior corrosion protection to the steel. Carbon steel sheet coated with zinc on both sides then subjected to an in-line heat treatment that converts entire coating to a zinc-iron alloy. The Galvannealed surface has a non-spangled matte finish appearing similar to uncoated cold rolled steel. A metal substrate consisting of cold rolled steel coated with a metallic coating of 55 percent aluminum and 43.5 percent zinc. Galvalume is a proprietary product that is also marketed as Zincalume. A metal substrate consisting of plain carbon steel that is typically soft (annealed) and does not have any metallic coating. Another term for ‘ zinc electroplated’. 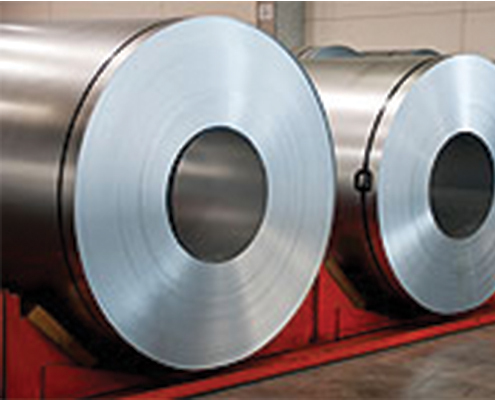 A cold rolled steel substrate that has a thin coating of pure zinc that is electrolytically deposited to the surface. A relatively soft, durable, lightweight, ductile, and malleable metal with appearance ranging from silvery to dull gray, depending on the surface roughness.